Manufactured in Etats-Unis from 1953 until 0. 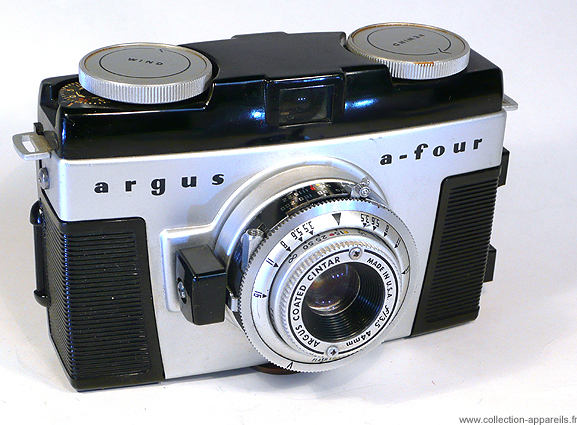 The A4 Argus is an economic camera, manufactured out of plastic. Its price (less than 40 dollars) made it more accessible than the brick C3 (approximately 70 dollars). Of course the features are not the same ones, since A-4 does not have a rangefinder and that its shutter is restricted to 1/200 second. The important thing was to have a complete and coherent range at the time when Kodak issued the 35 mm simple and economic, Pony 135 (less than 36 dollars). If one judges some by his current availability, the A-4 Argus achieved its target, it is much less current than Pony in the United States. It however has a pretty design for the time. It is due to Harley Earl. Although there were some evolutions, this model was not manufactured more than three years.